Most athletes and coaches realize that adequate carbohydrate intake is critical for optimum performance, enhanced recovery, and maintaining ideal body weight. This blog reviews carbohydrate recommendations based on training intensity and duration as well as body composition. The contribution of fat and carbohydrates during exercise is determined in part by the intensity of exercise. For moderate-intensity exercise (i.e., 65% of maximal oxygen uptake [VO2max]), about 50% of the energy needs come from blood glucose and muscle glycogen; however, during high-intensity exercises (85% of VO2max) the contribution of carbohydrates jumps to almost 70% of the energy needs (Coyle, 1995). Therefore, the intensity of exercise in part determines the amount of carbohydrates an athlete will need to consume. Another factor that determines the amount of carbohydrates that an athlete needs to consume is body composition. Compared to fats, the human body’s storage depots of carbohydrates are relatively small. Carbohydrates are stored in the body as glycogen and can be found in liver and muscle. In addition, a small amount of carbohydrates can be found in the circulating blood as glucose. Muscle glycogen represents the major source of stored carbohydrates (300 to 400 grams). Therefore, the amount of muscle an individual has can dictate the amount of carbohydrate (i.e., glycogen) that they can store. The liver is the next largest source of stored carbohydrate in the body. The liver can hold between 75 to 100 grams of glycogen. The blood is the final source of carbohydrate, contributing approximately 5 additional grams of carbohydrate as blood glucose (Jacobs & Sherman, 1999). Again, these levels of stored and circulating carbohydrate vary among individuals depending on body weight, or, more specifically, the amount of muscle mass. The duration of exercise also plays a role in carbohydrate intake. For exercise lasting less than 30 minutes there is no need to consume carbohydrates during exercise. However, during sustained, high-intensity exercise lasting between 30 to 120 minutes consuming a small amount of carbohydrate is advisable. Athletes involved in exercise lasting between 30 and 120 minutes should consume approximately 30 grams of a single or multiple transportable carbohydrate per hour. For exercise lasting between 120 to 180 minutes, athletes should increase their carbohydrate intake to approximately 60 grams of single or multiple transportable carbohydrate per hour. Finally, for exercise lasting longer than 120 minutes athletes need to consume approximately 90 grams of a single or multiple transportable carbohydrate per hour (Coleman, 2017). Due to the small amount of carbohydrates that can be stored in the body, an athlete needs to consume carbohydrates on a daily basis (Table). To determine what that daily amount is one needs to consider a couple of factors. One of these factors is the body weight of the athlete. Since the intensity of exercise determines the contribution of fats and carbohydrates to the total energy needs, one needs to also factor in an athlete’s training load. (Burke et al., 2011; Thomas et al., 2016). Carbohydrate intake recommendations for athletes range for 3 to 12 g of carbohydrate per kilogram of body weight per day (Burke et al., 2011; Thomas et al., 2016). The wide range in carbohydrate intake is due to the range of intensity of training programs that different athletes are involved in. For athletes doing light training programs (i.e., low-intensity exercise or skill-based exercise) it is recommended that they consume 3 to 5 grams of carbohydrate per kilogram of body weight per day (Burke et al., 2011; Thomas et al., 2016). This level of carbohydrate intake may also be suitable for athletes with large body mass or athletes who need to reduce energy intake to lose weight. For athletes that are engaged in moderate-intensity lasting 60 to 180 minutes, it is recommended that they consume 6 to 10 grams of carbohydrate per kilogram of body weight per day (Burke et al., 2011; Thomas et al., 2016). For those athletes participating in moderate- to high-intensity endurance exercise greater than 180 minutes per day, it is recommended that they consume 8-12 grams of carbohydrate per kilogram of body weight per day (Burke et al., 2011; Thomas et al., 2016). Since muscle is the prime user of carbohydrate, a better way to determine carbohydrate intake would be to calculate it based upon lean muscle mass. Unfortunately, nutritional recommendations based solely on muscle mass have not been determined. However, with the advent of newer technologies such as dual X-ray absorptiometry (DXA), which easily and accurately determine muscle mass, it may not be long before recommendations for carbohydrate intake will be based on muscle mass. Finally, a couple of things to consider regarding carbohydrate intake is that it is advisable to adjust intake around important exercise sessions to enhance performance and promote recovery. If an athlete is anticipating a very intense workout, then they may want to increase their carbohydrate intake prior to that workout. In addition, an athlete’s carbohydrate requirement may also change based on alterations in daily, weekly, or seasonal exercise goals. In a future blog, we will discuss carbohydrate intake before, during and after exercise based on an individual’s body composition as well as intensity and duration of exercise. Burke LM, Hawley JA, Wong S, Jeukendrup AE. Carbohydrates for training and competition. J Sports Sci. 2011;29(suppl 1) :17S-27S. Coleman EJ. 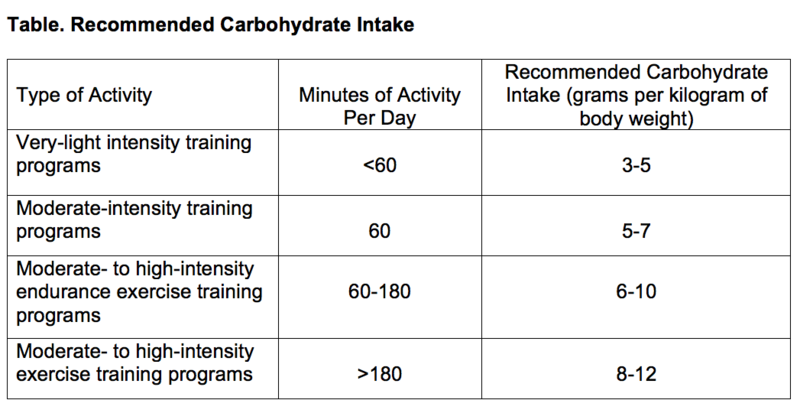 Carbohydrate and exercise. In Sports Nutrition: A Handbook for Professionals. 6th edition. Karpinski C (Ed). Academy of Nutrition and Dietetics 2017. Coyle EF. Substrate utilization during exercise in active people. Am J Clin Nutr 1995;61(suppl 4):968S-979S. Jacobs KA, Sherman WM. The efficacy of carbohydrate supplementation and chronic high carbohydrate diets for improving endurance performance. Int J Sport Nutr. 1999;9(1):92-115. Thomas DT, Erdman KA, Burke LM. Position of the Academy of Nutrition and Dietetics, Dietitians of Canada, and the American College of Sports Medicine: nutrition and athletic performance. J Acad Nutr Diet. 2016;116(3):501-528.